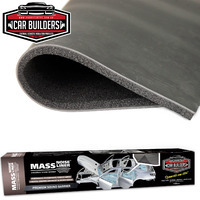 Car Builders Mass Noise Liner is a heavy weight barrier as used in high end luxury vehicles. The 5kg p/sm mass load vinyl upper layer is lined with a closed cell de-coupling layer to create the most effective means of acoustic blocking. Our egg shell closed cell foam is water proof and ideal for use on firewalls and floor pans. Mass Noise Liner is designed to go on top of our Stage 1 sound dampening sheets, its job is to filter out and block the most difficult airborne sound waves. 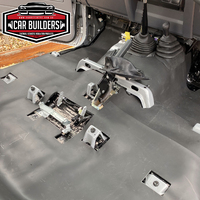 When used on top of our Stage 1 Sound Deadener it will any car as quiet as a brand new luxury vehicle. Exhaust drone - drop in as a boot liner to reduce exhaust drone particular common in 6's, V8's and flat fours. Note: due to the weight of our Mass Noise Liner it is not recommended for use on the underside of horizontal surfaces. 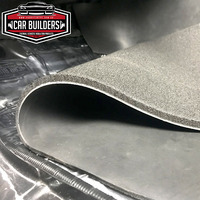 For these applications you should use our light weight foam such as Acoustic Liner, Water proof carpet underlay, Under bonnet insulator or our 6mm Insu-layer. Installed this over the stage one liner, on the floor. Made a significant difference non travel noise. It raised the floor about 12 mm which was nor biggie in the rear of the Mercedes Sprinter, but it was too thick for the front, which has insulated floor mats. Just had this product delivered and have installed it into my Suzuki Swift to try and get the noise levels down in the cabin. The product works well and is very easy to cut and shape as required. There is no odor and it has dropped the noise level average and peak by approximately 5db (using Bosch iNVH). Well done Carbuilders! I used the mass liner to cover the boot floor and beneath the main cabin carpet. It works well and is easy to instal without too much effort.